Research and practice concerned with improving learning must consider diversity and equality for both the education, and other corporate, workforces as well as the professional training routes to enter them. Diversity and equality are not options. UNESCO’s declaration, “Towards 2030: a new vision for education” directs us to “Ensure inclusive and equitable quality education and promote lifelong learning opportunities for all”. The cloud offers an arena for practitioners and researchers in all types of educational organizations and corporate learning and development settings to present and share ideas and knowledge through research projects, practices and models encompassing national contexts, organizational structures, cultures and practices, and in individual praxis and interaction. 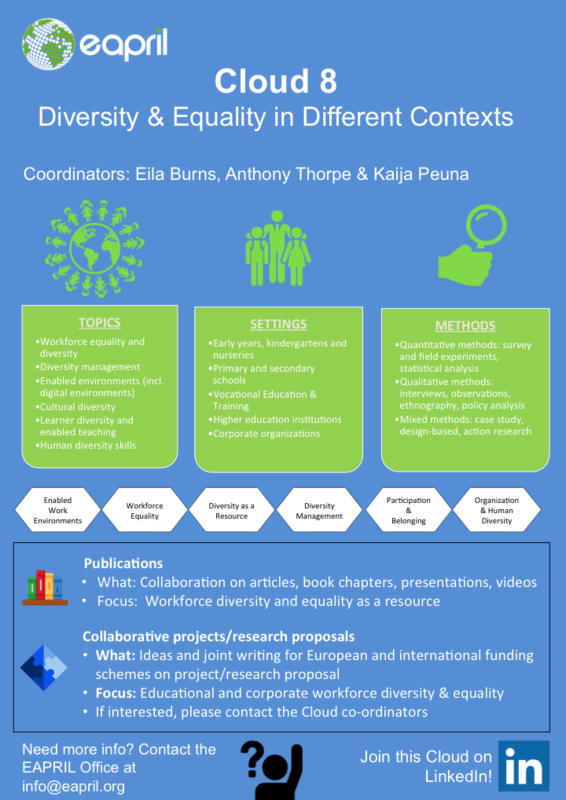 The network supports work in broad contexts including, but also going beyond, gender, ethnicity and race, whilst being open to questioning whether these categories are immutable in professional settings seeking to improve learning. Discussions and research about this theme can raise sensitive and challenging issues therefore the cloud encourages practices and ideas that enhance individuals’ participation and feelings of belonging by encouraging diversity of thought. Join this cloud on LinkedIn. Hybrid seminar/webinar on Diversity at Work! May 21 - Register by May 16!